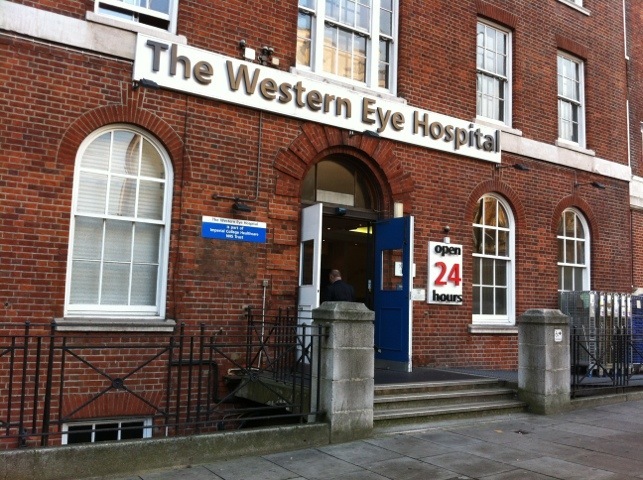 I left home at 7.00am this morning to get the train to London Paddington as today is my yearly eye hospital check up at the Western Eye Hospital nr Paddington. The train is absolutely crammed and I have someone sat next to me that really does need a bath (sorry had to be said). The train journey is fairly quick so I should arrive by 8.30am as the train goes direct. My so called appointment is 9.10am but I could almost guarantee they will be running late. Firstly I see a nurse who asks about my general health then checks my vision as would an optician. Next I have drops in the eye to dilate the pupil for the photographer to take a picture of the back of my eyes. Finally I see the Consultant who has a look at the pictures and my eyes to determine if they are ok or not – panic !! Hopefully everything is ok as I have already had two Vitrectomy operations and 10,000 laser burns in each eye to treat Pre Proliferative Retinopathy . So I have basically had all the treatment possible but my eyes have been stable now for probably 5+ years apart from the operation side affects. I will of course let you know how I get on and would really appreciate your experiences regarding eye problems. Proliferative diabetic retinopathy & Dark evenings. So the end of British Summer time has finally hit us all with vengeance and at 5.00pm tonight it was almost dark which is awful. As you may already know I have had numerous trips to eye clinics due to suffering with Diabetes Retinopathy for the past 7 years which is really awful and was a real scary shock when I was first told, it was Vision Express that actually discovered the problem and instantly booked me into my Diabetes eye clinic. The problem really started after I had small blood vessels at the back of my eyes burst which affected my vision and made it very cloudy in both eyes. The treatment started with laser to burn around the blood vessels which prevents any new weak blood vessels from forming which then burst. Laser itself is very uncomfortable indeed and I have had approx 10,000 burns in each eye which I am told is the limit but this does seem to have stopped the bleeding which is great news and I am so thankful to the Eye Specialists. After all the laser it still left my vision cloudy so meant I had to have what’s called a Vitrectomy in each eye which basically entails having the clear jelly in your eye removed (Your eye replaces this fluid), I can honestly say this operation is not nice at all and means you have dissolvable stitches in your eyeball (Gross I know). Having said all that If this had not been done I would certainly not be typing this Blog even though one eye has very poor vision and both eyes have awful night vision. So to the present day – my eyes seem to be stable at the moment and my latest eyesight test did not show any problems, even my prescription had not changed apart from my short sight vision which has got slightly worse. My next Diabetes eye check up is at the Western Eye Hospital in a few weeks time so fingers crossed I get the all clear but I am a little worried. One of the worst things I am left with is very poor small detail reading in both eyes meaning typing Blogs like this I have to have the page zoomed in to make the words larger, damage to my central vision in my right eye meaning details in my right eye is near on impossible to read, also my night vision is really bad and means I am unable to drive in poor light so this time of year is even worse as it is dark late afternoon. It means I have to carry a very bright torch with me that literally lights the whole path/road that cost me a fortune and even then it is really hard to see if I am on my own walking home from work, without a super bright torch I would literally be stuck and please let me know of any pocket torch companies who make super bright torches. We just take our vision for granted and I am also guilty of this in the past. Thanks for reading and please feel free to comment.